Yagura Karatachi was the Fourth Mizukage before Mei Terumi and also the Jinchuriki of Three Tails. The Village Hidden by Mist was known as Bloody Mist during his reign. He was than manipulated by Masked Man where Kisame Hoshigaki was instructed to kill Fuguki Suikazan. Yagura was killed by the grandfather of Iwabe Yuino who made appearance in Boruto. Ninjutsu Water Style – Aqua Mirror Jutsu [Prompt]: Summons a Clone that will have his skills all based in a selected unit of your opponent’s, all that unit’s skills will be inherited by this Clone except for his Mystery Skill. Its attributes will be inherited from 45% of Yagura’s attributes. Once this Clone is defeated, cannot be revived. Only one of these Clones can be created at a time. Taijutsu, Ninjutsu Taijutsu Attack: Attacks the opponent’s units in the front row and has a high chances of causing 7 COMBO and Low Float. Taijutsu, Ninjutsu Active Coral: Chases and Attacks a Knocked Down unit, causes Low Float and Acupuncture. Ninjutsu Water Style – Great Water Mass: Triggered with at least 10 COMBO, attacks 3 of the opponent’s units with Water attribute damage and will cause the units suffer from 5 COMBO. Ninjutsu Tailed Beast Chakra: Before the first action in a round, recovers Life points based on this unit’s Ninjutsu attribute, will also recover 20 Chakra points. 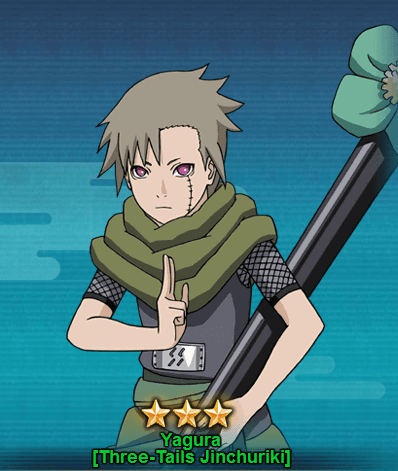 You can get Yagura [Three-Tails Jinchuriki] from the Jincuriki Treasure 1. It will take almost 60-70 seal scrolls draw to get Yagura.